Though VA doctors are still barred from prescribing medical cannabis or officially recommending the drug — even in the 29 states, Guam, Puerto Rico, and the District of Columbia where herb is legal for medical use — VHA Directive 1315 published on Dec. 8 states that care providers are clear to discuss the pros and cons of the substance with patients enrolled in state-approved medical marijuana programs, as it relates to their treatment. After months of ambiguity surrounding the VA’s approach to the recent wave of marijuana legalization that’s swept the country — a trend that veterans and caregivers overwhelming support — the new directive finally gives the department’s physicians and pharmacists the all-clear to discuss a vet’s medical cannabis use “due to its clinical relevance to patient care, and discuss marijuana use with any veterans requesting information about marijuana." 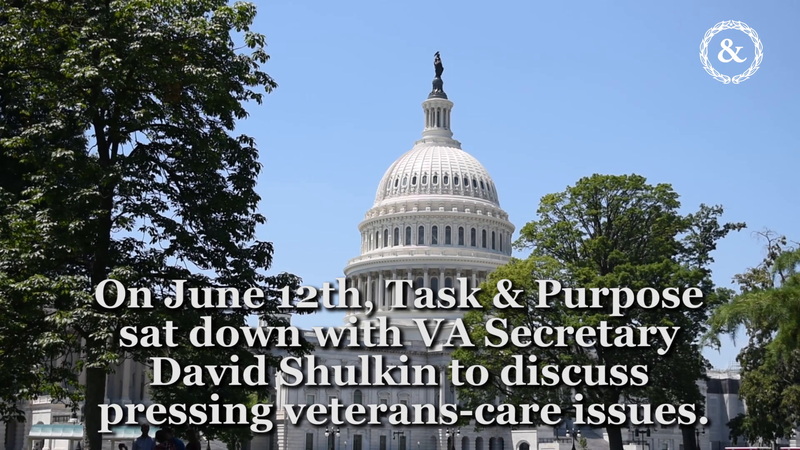 This is a far cry from the nebulous grey zones both vets and doctors at the VA were previously forced to navigate in order to talk candidly about the effects of medical cannabis with regards to a patient's treatment plan. As Task & Purpose reported in October, the administration's pot policy didn’t explicitly bar doctors from discussing weed with their patients, but it occasionally put individual clinics, patients, and care providers at odds with the department’s publicly stated stance on medical marijuana. It was less of a uniform policy and more of a patchwork of case-by-case decisions made at the clinical level, an unusual loophole that a few enterprising veterans and their docs were able to navigate. Now, the policy is scrawled out plain as day. Here’s how it works, Barney style: If you're enrolled in a state-approved medical cannabis program, you can (and should) discuss your pot use with your VHA care team. Furthermore, your VA physician is now directed to inquire about your use of the drug so that he or she can make any adjustments necessary to your treatment plan on a case-by-case basis, and with an eye toward your health, obviously. (Spoiler: doctors want to know what their patients are putting in their bodies before prescribing other medications.) On top of that, the VA has stated in no uncertain terms that being enrolled in a state-legal medical pot program will not prohibit you from participating in VHA programs. Under the new directive, discussions about medical weed between patients and their VA doctors will be documented in a vet’s medical record, which marks another step toward the department implementing a clear standard for its approach to medical cannabis use among veteran patients. “That’s a huge departure … from the previous ‘look the other way policy’” of recent years, Celli told Task & Purpose. Though the directive opens the doors for clearer conversations between veteran patients and their doctors about how medical weed will interact with their current medications, ongoing treatment plans, and overall health, the policy still doubles down on the VA’s adherence to the federal government’s stance on pot. At the federal level, marijuana remains a Schedule 1 substance — “drugs with no currently accepted medical use and a high potential for abuse,” according to the Drug Enforcement Administration. As such, the VA strictly prohibits its care providers from prescribing, officially recommending the drug, and enrolling veterans for participation in a state-approved marijuana program. Sure, some medical marijuana advocates may not think the new policy goes far enough, but for the many veterans who are interested in turning to alternative treatments like pot — 83% of vet households support medical cannabis use — the new policy means an open door, and a candid discussion with your Veteran Affairs physician.